September 1905: first stage appearance, at the Kabukiza, in a program commemorating the 2nd anniversary (3rd memorial service) of the passing away of late Ichikawa Danjûrô IX. July 1913: Kawarasaki Toranosuke took the name of Kawarasaki Chôjûrô IV. 1919: Chôjûrô joined the troupe led by Ichikawa Sadanji II. March 1921: Chôjûrô played at the Suehiroza (Nagoya) the role of Obô Kichisa in Kawatake Shinshichi II's drama "Sannin Kichisa"; his stage partners were Onoe Eizaburô VII (Ojô Kichisa) and Onoe Kôzô II (Oshô Kichisa). Summer 1928: Ichikawa Sadanji II organized the first tour of a Kabuki troupe outside Japan; Chôjûrô took part in this tour [more details]. May 1931: founding of the Zenshinza troupe, a left-wing and progressive theater troupe led by Nakamura Kan'emon III and Chôjûrô. November 1933: the Zenshinza troupe produced for the first time the dance-drama "Kanjinchô", in Tôkyô at the Shinbashi Enbujô, with Chôjûrô (Benkei), Nakamura Kan'emon III (Togashi) and Kawarasaki Kunitarô V (Yoshitsune). 1936: Chôjûrô played the role of Kôchiyama Sôshun in the eponymous movie directed by Yamanaka Sadao. June 1942: Chôjûrô played for the first time the role of Tokugawa Tsunatoyo in the drama "Ohama Goten", which was staged at the Shinbashi Enbujô. 1944: Chôjûrô played the role of Miyamoto Musashi in the eponymous movie directed by Mizoguchi Kenji. 1958 ~ 1959: the Zenshinza troupe produced the bombastic play "Gedatsu" with Chôjûrô and Kawarasaki Kunitarô V in the roles of Taira no Kagekiyo and the courtesan Akoya. The play was performed in January 1958 in Nagoya (Misonoza), in February 1958 in Ôsaka (Kabukiza), in March 1958 in Kyôto (Minamiza) and in July 1959 in Tôkyô (Meijiza). 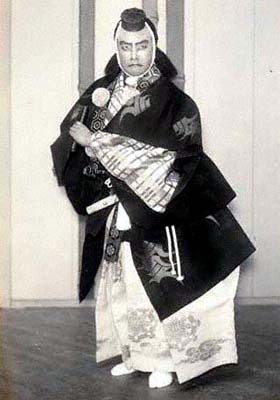 December 1959: Chôjûrô played at the Meijiza the role of Satsuma Gengobê in Namiki Gohei I's drama "Godairiki Koi no Fûjime"; his stage partners were Nakamura Kan'emon III (Sasano Sangobê) and Kawarasaki Kunitarô V (Sakuraya Koman). 1960: first stay in the Popular Republic of China. February 1963: Chôjûrô played for the last time the role of Tokugawa Tsunatoyo in the drama "Ohama Goten", which was staged at the Minamiza (Kyôto). 1965: second stay in the Popular Republic of China. January 1967: ideological breaking off with Nakamura Kan'emon III; Chôjûrô was no more a member of the Zenshinza troupe. 22 September 1981: Chôjûrô died. Kawarasaki Chôjûrô IV was the cofounder of the Zenshinza troupe and an amazing tachiyaku, able of playing the best roles in the aragoto style like Benkei ("Kanjinchô") or the wicked priest Narukami ("Narukami"). Kawarasaki Chôjûrô IV in the role of Musashibô Benkei in the dance-drama "Kanjinchô"